This slide from his December 2016 Mobile is Eating the World talk depicts the rise and eventual leveling off of PC computing, mobile, and the next wave of AR/VR. If you haven’t seen the presentation, it’s very good (as are his newsletters), and this particular slide summarizes a shift in mobile technology from frenzy to scaling, or in his terms, moving from “Creating the tech” to “What can we build with this tech?” We’re in the Deployment stage where the mobile S-curve is scaling and while that certainly applies to mobile hardware, it helps me think about the direction of mobile apps, specifically a shift in focus to enterprise apps. Evans describes us at the end of the mobile frenzy, and there’s plenty of data to support that. For example, Comscore’s 2017 Mobile Report notes more than half of all smartphone users download less than one app per month. That same report shows that the top app, Facebook, accounts for half of all app time and the top ten account for almost ALL app time. So we’re downloading fewer apps and using only a few of the apps we download. 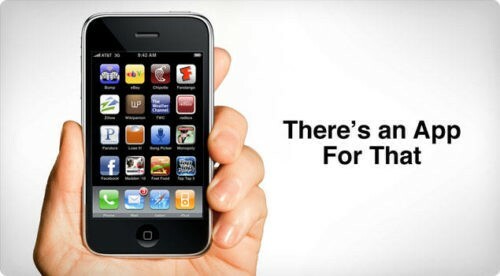 I can’t say I miss “There’s an app for thatTM” (Apple trademarked it in 2010! ), but those statistics paint a dire picture for new apps. But I don’t think the dire picture applies to enterprise apps, where the important number is ROI. If we’re past the frenzy, that means it’s time to scale, or as Benedict Evans asks, “What can we build with this?” I think we’ll see that scale through enterprise apps for employees that add value through productivity, quality, safety, efficiency, and generally improving the employee experience to create revenue and cost savings. This will happen while App Store and usage statistics continue to show some degree of app decline (or app fatigue) from consumers, but we shouldn’t conflate the end of the frenzy with less-valuable mobile apps. I don’t expect App Store download or usage statistics to account for enterprise apps, and it’s not going to change the S-curve, but the scale phase presents an opportunity to add at least as much value as the frenzy (probably more, but I’ll let that go so we don’t have to debate the value of Angry Birds). We are well beyond the PC frenzy, and there is still tremendous opportunity as enterprises continue to leverage cloud services, SaaS applications, and new integrations with their PC-based applications. 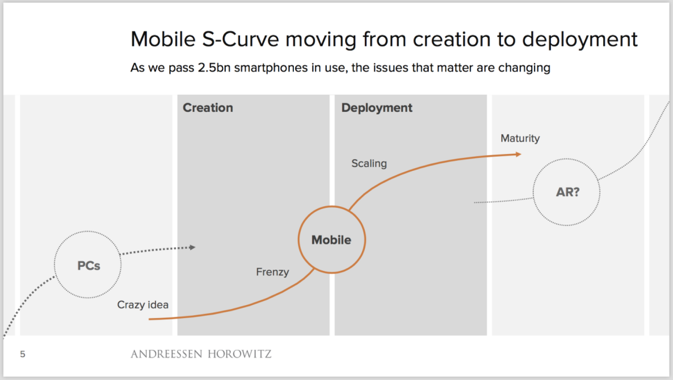 It’s the same with mobile—enterprises will be responsible for pushing mobile up the scaling part of the S-curve. “Enterprise apps” can mean different things, but for this post, let’s define them as mobile solutions an organization deploys for employees or consumers to meet business objectives. The term usually describes only apps that target employees, but I think enterprise apps can also target consumers (e.g., mobile customer support extension of a CRM). Either way, these solutions are separate from social, content-driven, or gaming apps. It’s extremely difficult to build the next great social or content app, and even if you do, Facebook or Google awaits. I also think most of the low-hanging fruit is gone for consumer apps. Most organizations have public-facing mobile apps and they will continue to add new features (e.g., we’re adding proximity and voice features for our clients), but it’s becoming tougher to break new ground with consumer apps in a way that creates real business value. But there is still plenty of room for enterprise apps. Take a look at your phone and count apps for personal vs. work use. (For the sake of argument, consider a corporate-owned device as one with your personal device.) I bet it’s 7 to 1 or higher, but that ratio will change. When I joined Shockoe earlier this year, in my first few weeks I started using eight new apps for work: Google Drive, Google Calendar, Hangouts, Slack, Trello, Expensify, a VPN, and an internal app for our office. I’m an average mobile user at best and definitely download less than one app/month (maybe that’s because Stranger Things reminds me of my childhood … the 1980s part, not the world-ending monsters), but according to those comScore stats, in my first few weeks at Shockoe I downloaded an entire year’s worth of apps. Those were basic apps for HR, collaboration, and personal productivity, and it’s the operational apps, many of which will never hit the App Store, that present a huge opportunity. Consider a warehouse operator who picks up an Android tablet when she arrives at work then opens an app to see her order list, most efficient picking route, and connection to a wearable scanner. That’s a valuable app for the warehouse, but it doesn’t rank on app download or screen-time statistics. We need a better way to measure enterprise app adoption. Why compare social or gaming app statistics to a logistics app that optimizes shipping loads, routes, and the overall customer and employee experience? Or why compare them to mobile solutions that enable sales teams, train employees, or track assets? 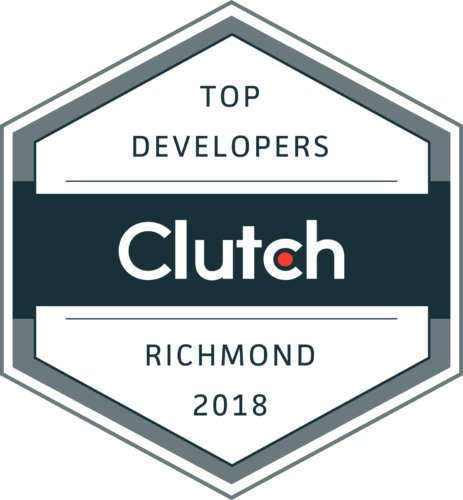 Shockoe has always had an enterprise-app focus, and I think the mobile challenges facing our clients are similar to challenges with SaaS applications that helped enterprises scale along the PC S-curve over the last ten years: How do you know when to go with a mobile app (or a SaaS solution)? What technologies and vendors should you use? How do you secure them? How do you effectively integrate apps into back-end systems and your overall technology portfolio? And critically, how will you measure mobile app success? That measure, hopefully, an ROI identified up front and validated after the app implementation, is a much more important number of enterprise apps than downloads or app usage time. The mobile app frenzy was fun and while the scale phase may not seem as exciting, it is for many of our clients. The slowing innovation in mobile hardware (where smartphones get better but have fewer groundbreaking features) gives larger organizations, governments, and other non-digital natives time to catch up on mobile apps. And they need to catch up quickly because the frenzy phase on that AR/VR S-curve feels rather steep.